The first of eight press conferences, on Monday morning, was entitled "Cosmic Explosions & Their Aftermath." Speakers were Scott Ransom (National Radio Astronomy Observatory) on the discovery of a millisecond pulsar in a triple-star system, Remy Indebetouw (University of Virginia and National Radio Astronomy Observatory) on the resolution by ALMA of Supernova 1987A’s dust factory and particle accelerator, and Teddy Cheung (Naval Research Laboratory) on the first measurement of gravitational lensing in gamma rays. AAS Press Officer Rick Fienberg moderated the briefing. The first of eight press conferences, on Monday morning, was entitled "Cosmic Explosions & Their Aftermath." 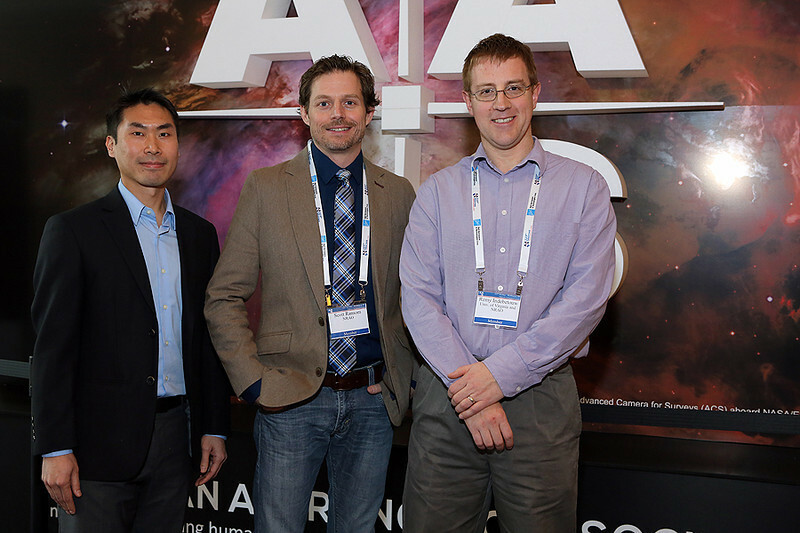 Teddy Cheung (Naval Research Laboratory) presented the first measurement of gravitational lensing in gamma rays, Scott Ransom (National Radio Astronomy Observatory) described the discovery of a millisecond pulsar in a triple-star system, and Remy Indebetouw (University of Virginia and National Radio Astronomy Observatory) showed how ALMA resolved Supernova 1987A’s dust factory and particle accelerator. AAS photo © 2014 Joson Images.